I mentioned that there was a famous song from the Civil War which had the same name, and I would try to find the words for you. 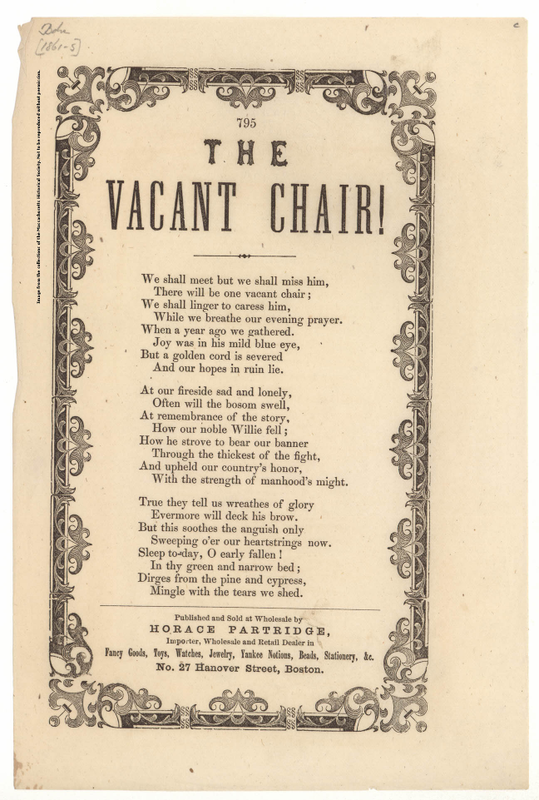 The classic Civil War poem and song was actually called “The Vacant Chair.” Here’s some information about the poem, and the song, which would eventually follow. “The Vacant Chair” was written to commemorate the death of John William Grout (1843–1861), a Union soldier from Worcester, Massachusetts, and an 1859 graduate of Phillips Academy in Andover. Mr. Grout, known as “Willie,” was a very popular local son, who served with the Union’s 15th Massachusetts as a Second Lieutenant, and was killed at age eighteen at the Battle of Ball’s Bluff, in October, 1861. Lt. Grout’s body was recovered from the Potomac River on November 5, 1861, after being washed 35 miles back to Washington, D.C. His remains were identified by the name written on his clothing. “The Battle of Ball’s Bluff” was a devastating battle for the families of the Worcester area. There were almost 500 killed, wounded or captured from the 15th Massachusetts regiment. I wanted to include a video of the song being performed, as well. There were many I found, some dating back to the early 1900’s. However, I’ve shared this one, from more recent time, featuring Kathy Mattea. This entry was posted in HISTORY CHANNELS, HOLIDAYS, THE PRICE FOR FREEDOM, VIDEOS, POWER POINTS, AND PHOTOS TO SHARE and tagged civil war poems, civil war songs, Kathy Mattea, the vacant chair. Bookmark the permalink.